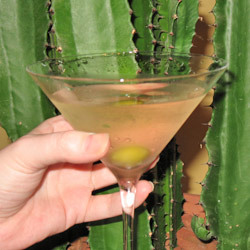 The Tequini Cocktail is a Martini made with tequila. As was explained to me one day by a customer at the restaurant's lounge during a Martini promotion, this recipe is for tequila lovers. 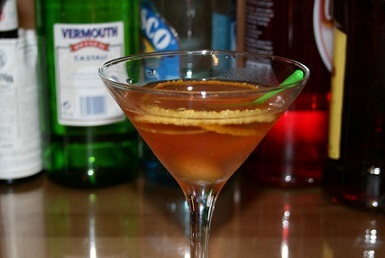 Tequinis are a drier cocktail than what you might normally expect for a tequila drink. It certainly features the taste of a quality tequila - and that is the absolute bottom line. Use a quality, dry tequila. The tequila-loving lounge customer asked me to make him one, which I did. He also asked me not to "pick" the olive, but just to toss it in the glass. He said not to bother with the lemon twist. He tasted - and approved. He then bought several Tequinis for other guests who expressed an interest. 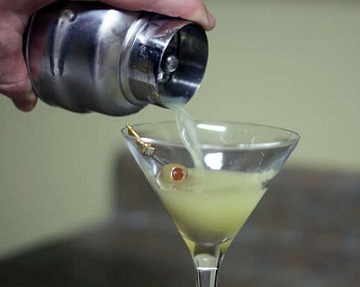 Even though they were vodka martini and gin martini "experts," they approved of this beverage. I asked the customer when he first tried this cocktail recipe. He said, "You should remember, you're as old as I am." (That hurt a bit.) He said the drink was popular during the 1960's and into the 70's. I pleaded forgiveness. I could not remember it. But in those years, I wasn't really "into" tequila. He forgave me. There you have it. You'll appreciate this beverage! Enjoy your Tequini Cocktail, especially if you enjoy a dry tequila! And please enjoy the company of those you share it with! "Happy National Margarita Day! Now, hand over the tequila and no one gets hurt!"